Your institution must subscribe to JoVE's Engineering section to access this content. We present a protocol on modular design and production of intelligent robots to help scientific and technical workers design intelligent robots with special production tasks based on personal needs and individualized design. Zhang, L., Zhu, J., Ren, H., Liu, D., Meng, D., Wu, Y., Luo, T. The Modular Design and Production of an Intelligent Robot Based on a Closed-Loop Control Strategy. J. Vis. Exp. (128), e56422, doi:10.3791/56422 (2017). Intelligent robots are part of a new generation of robots that are able to sense the surrounding environment, plan their own actions and eventually reach their targets. In recent years, reliance upon robots in both daily life and industry has increased. 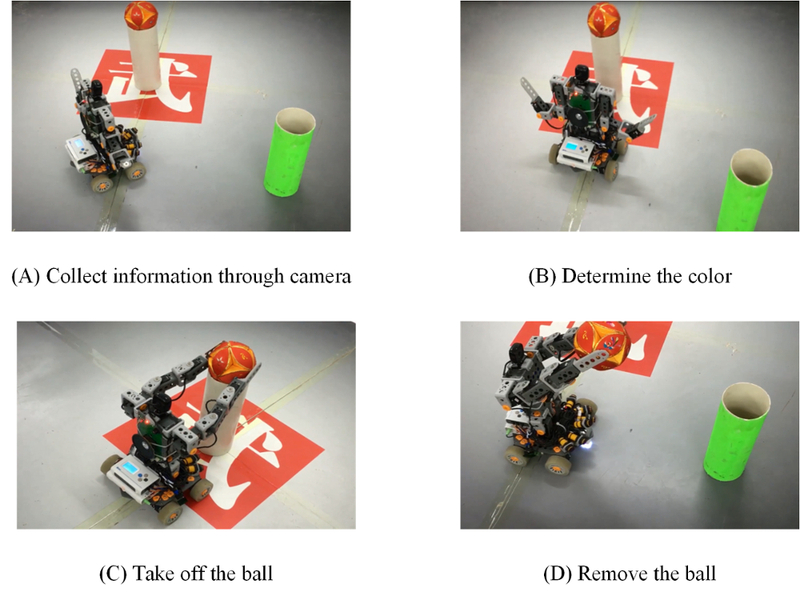 The protocol proposed in this paper describes the design and production of a handling robot with an intelligent search algorithm and an autonomous identification function. First, the various working modules are mechanically assembled to complete the construction of the work platform and the installation of the robotic manipulator. Then, we design a closed-loop control system and a four-quadrant motor control strategy, with the aid of debugging software, as well as set steering gear identity (ID), baud rate and other working parameters to ensure that the robot achieves the desired dynamic performance and low energy consumption. Next, we debug the sensor to achieve multi-sensor fusion to accurately acquire environmental information. Finally, we implement the relevant algorithm, which can recognize the success of the robot's function for a given application. The advantage of this approach is its reliability and flexibility, as the users can develop a variety of hardware construction programs and utilize the comprehensive debugger to implement an intelligent control strategy. This allows users to set personalized requirements based on their needs with high efficiency and robustness. Robots are complex, intelligent machines that combine knowledge of several disciplines, including mechanics, electronics, control, computers, sensors and artificial intelligence 1,2. Increasingly, robots are assisting or even replacing humans in the workplace, especially in industrial production, due to the advantages robots possess in performing repetitive or dangerous tasks. The design of the intelligent robot protocol in the current study is based on a closed-loop control strategy, specifically path planning based on a genetic algorithm. Furthermore, the functional modules have been strictly divided3,4, which may provide a solid foundation for future optimization work, so that the robots have a strong capacity for upgrades. The modular implementation of the robotic platform is based primarily on the following methods: multi-dimensional combination control strategy in motor control module5,6, and intelligent exploration based on a genetic algorithm in the optimization algorithm module. We use double closed-loop control of the DC motor and four-quadrant motor operation in the motor control module. Double closed-loop speed control means that the output of the speed regulator serves as the input of the current regulator, allowing it to control the current and torque of the motor. The advantage of this system is that the torque of the motor can be controlled in real-time based on the difference between the given speed and the actual speed. When the difference between given and actual speeds is relatively large, the motor torque increases and the speed changes faster to drive the motor speed toward the given value as quickly as possible, which makes for rapid speed regulation7,8,9. Conversely, when the speed is relatively close to the given value, it can automatically reduce the torque of the motor to avoid excessive speed, allowing the speed to achieve the given value relatively quickly with no error6,10. Since the equivalent time constant of the electric current loop is relatively small, the four-quadrant motor11,12 can respond more quickly to suppress the impact of interference when the system is subject to external interference. This allows it to improve the stability and anti-jamming ability of the system. We choose a genetic intelligent optimization algorithm with the highest efficiency based on the results of a simulation run in MATLAB. A genetic algorithm is a stochastic parallel search algorithm based on the theory of natural selection in genetics. It constitutes an efficient method for finding the global optimal solution in the absence of any initial information. It regards the solution set of the problem as a population, thereby increasing the quality of the solution via continuous selection, crossover, mutation and other genetic operations. With regard to path planning by intelligent robots, difficulty arises as a result of insufficient initial information, complicated environments and nonlinearity. Genetic algorithms are better able to solve the problem of path planning because they possess global optimization ability, strong adaptability and robustness in solving nonlinear problems; there are no specific restrictions on the problem; the calculation process is simple; and there are no special requirements for the search space 13,14. NOTE: The chassis, which comprises the baseboard, motor, wheels, etc., is the primary component of the robot responsible for its motion. Thus, during assembly, keep the bracket straight. Tin the wire lead and both the positive and negative electrodes. Solder two wire leads onto the two ends of the motor, connecting the red lead to the positive electrode and the black lead to the negative electrode. Assemble the shaft sleeve, the motors and the wheels. Connect the motor to the shaft sleeve and secure it with a screw. Insert the shaft sleeve into the center of the wheel hub. Install the completed structure onto the chassis. Drill two holes, 3 mm in diameter, in the center of chassis, to allow for installation of the motor driving module. Connect the motor to the motor driving module. Drill one hole 1 cm from both the left and right edges of the chassis for installation of the bracket for the infrared sensors on the bottom. Install two fasteners onto the center of the two sides of the chassis. NOTE: To ensure normal operation of the infrared sensors, ensure that the connecting piece is perpendicular to the chassis. Install the steering gear in symmetry. Because of the large torque generated by the operation of the steering gear, ensure that the bolts are installed in a manner that provides a firm and impervious joint. Install four infrared sensors on the center of the machine. Place the 14.8 V power supply in the center of the machine, and affix the Microcontroller Unit (MCU) to the battery pack. Affix four range sensors to the upper part of machine. Adjust the angle between each sensor and the ground to 60°, to guarantee detection accuracy relative to the working table. Install the dual-axis tilt sensor, which is used to detect cases when the machine fails to reach its target in the working area. 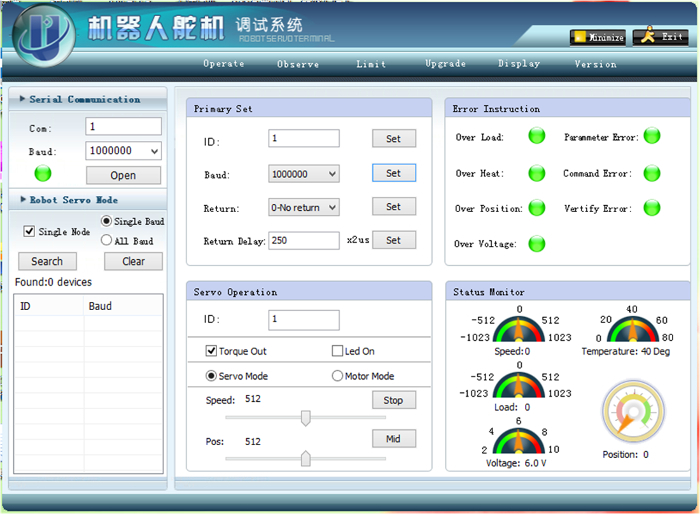 Set the steering engine's baud rate to 9600 bits/s, the rate limitation to 521 rad/min, the angular limitation to 300° and voltage limitation to 9.6 V in the working interface. Set the working mode of the robot steering gear to "steering engine mode." NOTE: ID1: leftward driving module; ID2: rightward driving module; ID5: left-front steering engine; ID6: right-front steering engine; ID7: left-rear steering engine; ID8: right-rear steering engine. Cascade the steering engines one by one and connect the cascade to the controller. Connect the sensors to their respective controller interfaces. It should be noted that the sensor whose connector bears a triangular mark is the ground (GND). NOTE: AD1: front infrared photoelectric sensor on underside; AD2: right infrared photoelectric sensor on underside; AD3: rear infrared photoelectric sensor on underside; AD4: left infrared sensor on underside; AD5: front infrared distance measuring sensor; AD6: right infrared distance measuring sensor; AD7: rear infrared measuring sensor; AD8: left infrared distance measuring sensor; AD9: left-front anti-fall infrared photoelectric sensor; AD10: right-front anti-fall infrared photoelectric sensor; AD11: right-rear anti-fall infrared photoelectric sensor; AD12: left-rear anti-fall infrared photoelectric sensor. NOTE: The robot can determine its location in the working table by analyzing the logic level of the infrared sensors. For example, if the logic levels of the left and front sensors are 0, the robot must be in the upper-left region of the working table. NOTE: The distance sensor is an analog sensor. As the distance varies, the sensor's signal strength feedback and corresponding measured values will also vary. The measured values will be relayed to the host machine via digital sensors so that the robot can identify changes in its surroundings. Position the tilt-angle sensor horizontally and record its measured values. Incline the sensor toward two different directions and record its measured values. If the measured values are within the error range, the sensor can be regarded as being in regular operation. Construct the simulation model of the DC motor, based on the DC motor voltage balance equation, flux linkage equation and torque balance equation. where ud is direct axis voltage, uq is quadrature axis voltage. Rd and Rq denote direct axis resistance and quadrature axis resistance respectively. , , , , represent direct axis current, direct axis current, direct axis flux and quadrature axis flux. where and denote the coefficient of direct axis self-inductance and quadrature axis self-inductance respectively. and are coefficient of mutual inductance. , represent electromagnetic torque and load torque. Establish torque balance equation calculated by . Apply double closed-loop control of the DC motor. Utilize the output of the speed regulator as the input to the current regulator to regulate the motor's torque and current. The transfer function of the PI current regulator is shown as , where is the proportional coefficient of the current regulator and is the lead time constant of the current regulator. It can be obtained by the scale coefficient , and the integral coefficient . Note: When Q1 and Q4 are turned on and the motor is in the forward electric state and the first quadrant running state. When Q3 and Q4 are turned on, the motor is in the energy braking state and the second quadrant running state. When Q2 and Q3 are turned on, the motor is in the reverse electric state and the third quadrant motion state. 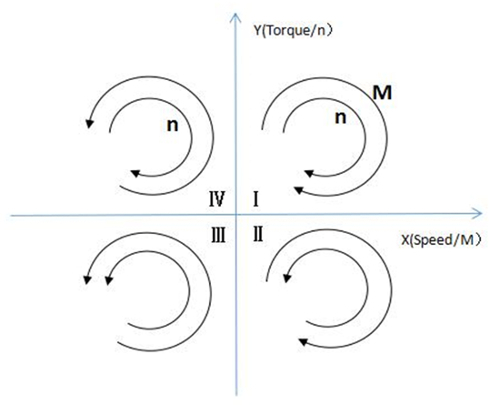 When Q1 and Q2 are turned on, the motor is in the reverse energy braking state and the fourth quadrant motion state. 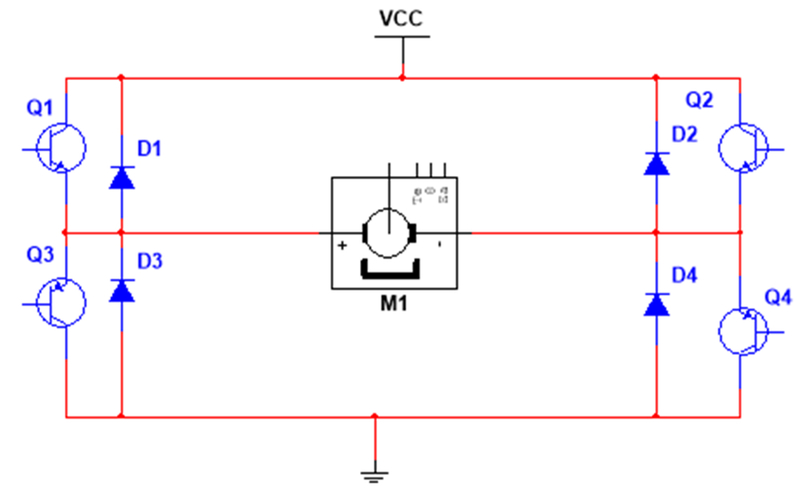 Apply pulse width modulation (PWM) to regulate the speed of the DC motor. Modulate the DC voltage pulse width (duty cycle) applied to the motor armature by controlling the on-off of the electric switch when the voltage of DC motor power supply remains essentially unchanged, thus modulating the average value and the rotation speed input to armature voltage of the motor. Use the USB download line to import a Binary (BIN) file generated by KEIL5 into the controller. Select the program to be executed. Use an optical camera to collect images and verify the scanned color using the number of the bounced two-dimensional array. Lift the object with the mechanical arms. Issue a command to transport the object to the designated location using the camera and driving motor of the robot. Use the four optical sensors on the robot to detect the locations of surrounding obstacles. Command the steering engine to lift the mechanical shovel and clear obstacles in the designated areas. Use the genetic algorithm to determine the most effective search path. Use self-recognition to prevent falling from the workbench to separate workers from the machine working area and ensure worker safety. Modify signals based on the difference in altitude between the four upper optical sensors, which recognize the workbench and the ground. Analyze the mutable signals to determine the location of the edges of the workbench. Command the machine to avoid the edges of the workbench. Figure 1: Construction of the chassis. Please click here to view a larger version of this figure. Figure 2: Installation of the infrared sensors. Please click here to view a larger version of this figure. Figure 3: The effect of installation. Please click here to view a larger version of this figure. Figure 4: Debugging work screen. Please click here to view a larger version of this figure. Figure 5: Connection of robot steering gear. Please click here to view a larger version of this figure. Figure 6: Electrical connection principles. Please click here to view a larger version of this figure. Figure 7: Electrical connection principles. Please click here to view a larger version of this figure. Figure 8: Set ID number. Please click here to view a larger version of this figure. Figure 9: Two sensors. Please click here to view a larger version of this figure. Figure 10: Simulation model of DC motor. Please click here to view a larger version of this figure. Figure 11: Current regulatory system. Please click here to view a larger version of this figure. Figure 12: Simulation model of double closed-loop control. Please click here to view a larger version of this figure. 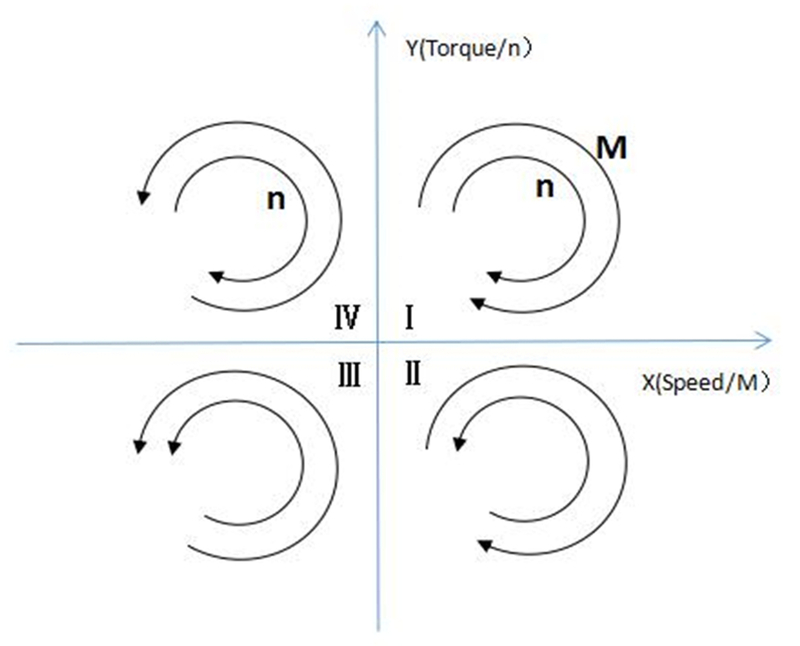 Figure 13: Diagram of four-quadrant operation of the motor. Please click here to view a larger version of this figure. 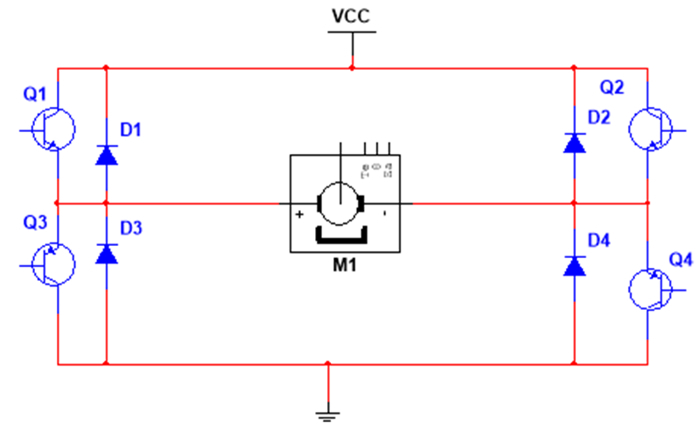 Figure 14: H-bridge circuit. Please click here to view a larger version of this figure. 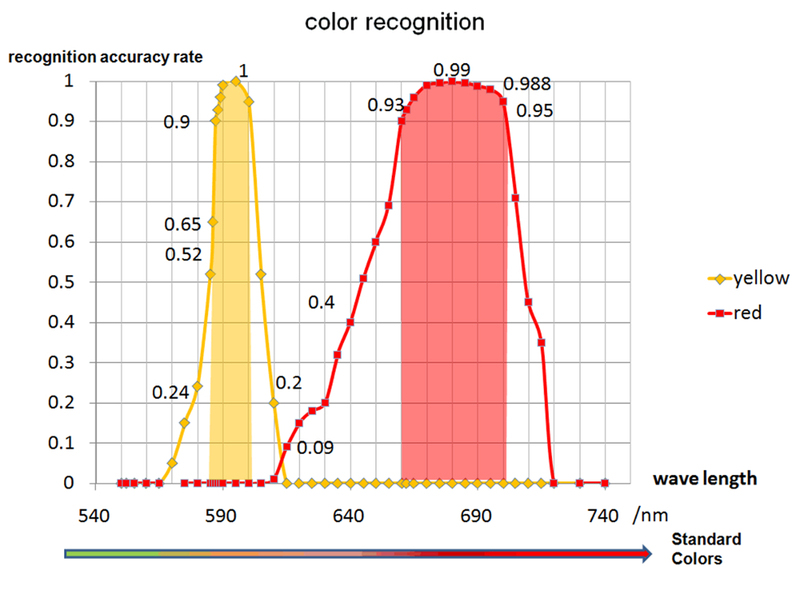 Figure 15: The workflow of color recognition. Please click here to view a larger version of this figure. Figure 16: The workflow of quick search. Please click here to view a larger version of this figure. Figure 17: Simulink diagram. Please click here to view a larger version of this figure. Figure 18: Color recognition accuracy under the influence of reflected light at different wavelengths. Please click here to view a larger version of this figure. 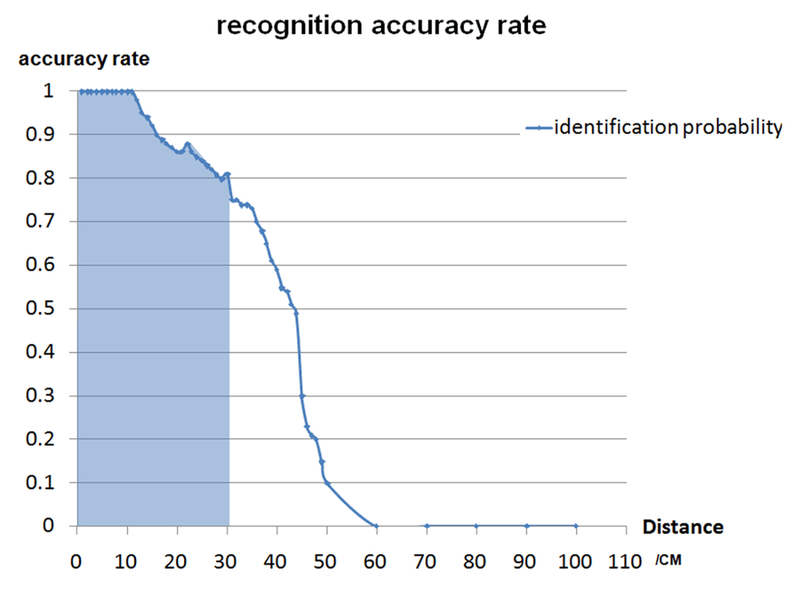 Figure 19: Relationship between the camera's color recognition accuracy and the distance. Please click here to view a larger version of this figure. 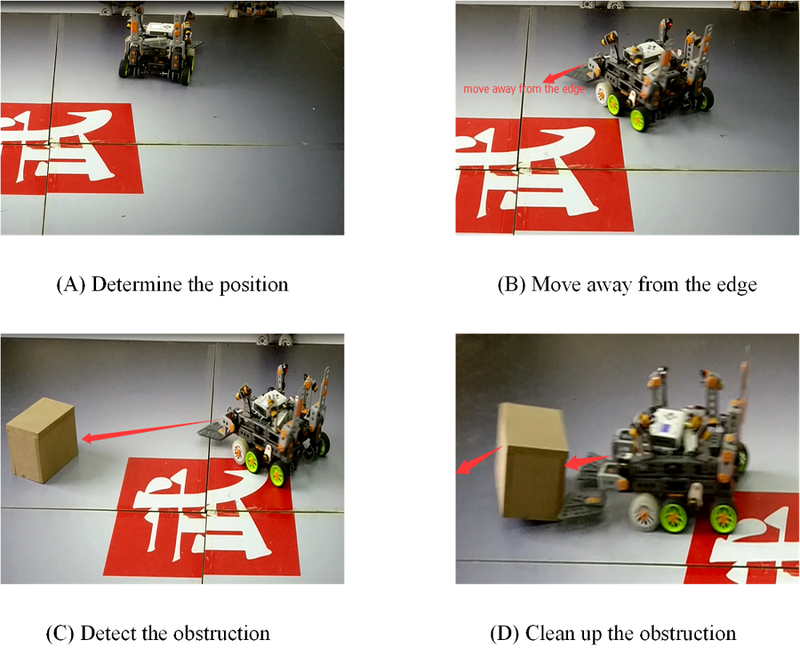 In this paper, we designed a type of intelligent robot that can be built autonomously. We implemented the proposed intelligent search algorithm and autonomous recognition by integrating several software programs with hardware. In the protocol, we introduced basic approaches for configuring the hardware and debugging the intelligent robot, which may help users design a suitable mechanical structure of their own robot. However, during actual operation, it is necessary to pay attention to stability of the structure, its operating range, the degree of freedom and space utilization, to ensure that these parameters meet the requirements. A reasonable mechanical structure ensures high precision, high flexibility, and high robustness of the robot. To design complicated mechanical structures, the user can combine software such as Adams to construct a simulation model and apply virtual prototyping technology. This may allow them to exclude possibilities that do not satisfy the technical requirements or possibilities that are not mechanically feasible. One potential issue is the inability of the robot to accurately achieve its desired functions. This may stem primarily from two causes. The first is the inability of the sensors to meet the requirements. For example, during the first test, the cleaning robot in this study was unable to successfully push obstacles out of the working area. 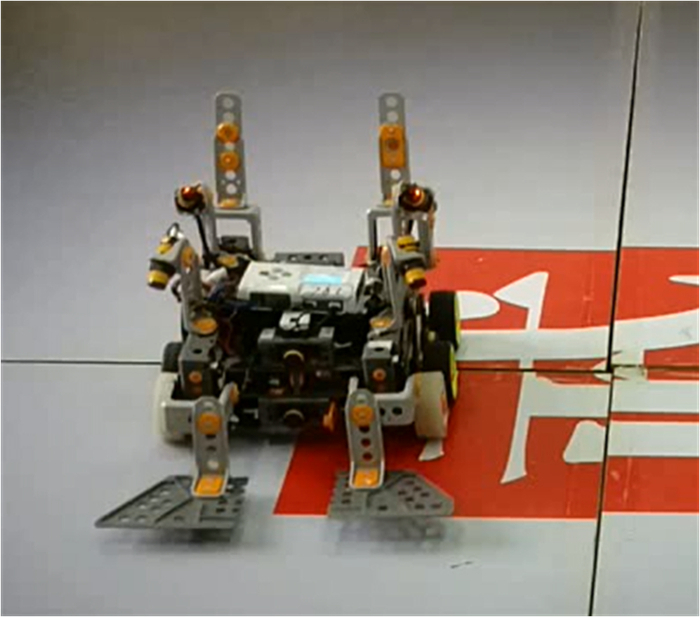 This was because the range of the infrared sensor on the equipment was somewhat narrow, which meant that the robot could not achieve the requisite acceleration when it detected an obstacle. This issue could be solved by increasing the detection range of the infrared sensor. To address these issues, an additional level of debugging of the sensors may be necessary, based on the situation or application. The second is the inability of the selected motor to meet the performance requirement. When choosing a motor, priority must be given to a motor with suitable starting performance, operational stability and low noise within the budget. To begin design and production of a new robot, the parameters for a manual configuration scheme must be defined to control the behavior of the robot, so that it may adapt to the demands of a new task. Simultaneously, all processes must follow the steps presented in the protocol. An advantage of the modular design of the robot lies in its clear division of work, which allows it to be developed via the collaboration of various engineers. Mechanical engineers design the structure of the hardware, electrical engineers design the motor control strategy, and controls engineers design the search algorithm. Thus, the work of each module can be developed independently to accomplish a specific task. We provide a basic design scheme for each module, to help users search for the optimal scheme for a particular application. The range of potential applications will expand considerably as intelligent robot technology matures. It will prove to be an invaluable resource to individuals in the fields of ocean development, space exploration, industrial and agricultural production, social service, and entertainment, to name a few. This technology will gradually replace human beings in dangerous and unsanitary work environments. Intelligent robots will continue to develop toward multi-robot cooperation, and intelligent and networked direction. The authors would like to express their gratitude to Mr. Yaojie He for his assistance in performing the experiments reported in this paper. This work was supported in part by the National Natural Science Foundation of China (No. 61673117). Charalampous, K., Kostavelis, I., Gasteratos, A. Robot navigation in large-scale social maps: An action recognition approach. Expert Syst Appl. 66, (1), 261-273 (2016). Huang, Y., &Wang, Q. N. Disturbance rejection of Central Pattern Generator based torque-stiffness-controlled dynamic walking. Neurocomputing. 170, (1), 141-151 (2015). Tepljakov, A., Petlenkov, E., Gonzalez, E., Belikov, J. Digital Realization of Retuning Fractional-Order Controllers for an Existing Closed-Loop Control System. J Circuit Syst Comp. 26, (10), 32-38 (2017). Siluvaimuthu, C., Chenniyappan, V. A Low-cost Reconfigurable Field-programmable Gate Array Based Three-phase Shunt Active Power Filter for Current Harmonic Elimination and Power Factor Constraints. Electr Pow Compo Sys. 42, (16), 1811-1825 (2014). Brogardh, T., et al. Present and future robot control development - An industrial perspective. Annu Rev Control. 31, (1), 69-79 (2007). Wang, E., Huang, S. A Novel DoubleClosed Loops Control of the Three-phase Voltage-sourced PWM Rectifier. Proceedings of the CSEE. 32, (15), 24-30 (2012). 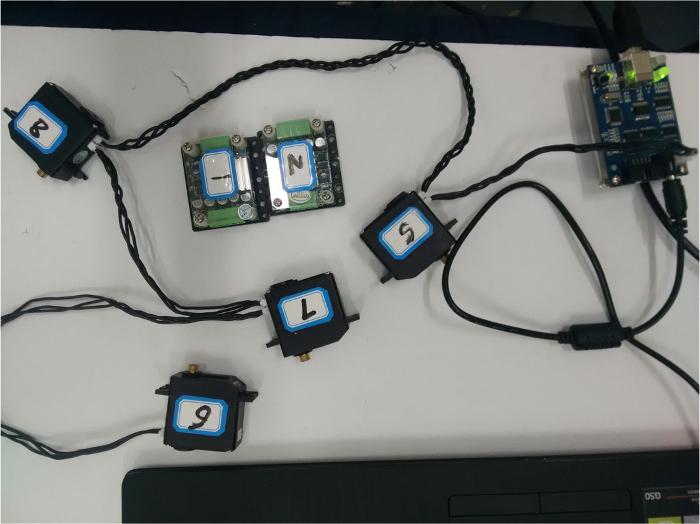 Li, D. H., Chen, Z. X., Zhai, S. Double Closed-Loop Controller Design of Brushless DC Torque Motor Based on RBF Neural Network. Proc. 2nd International Conference on Frontiers of Manufacturing Science and Measuring Technology. (ICFMM 2012), 1351-1356 (2012). Tian, H. X., Jiang, P. L., Sun, M. S. Double-Loop DCSpeed Regulation System Design Basd On OCC). Proc. 4th International Conference on Advances in Materials and Manufacturing (ICAMMP 2013), 889-890 (2014). Xu, G. Y., Zhang, M. Double Closed-Loop Feedback Controller Design for Micro Indoor Smart Autonomous Robot). Proc. International Conference on Material Science and Engineering Technology. (ICMSET 2011), 474-479 (2011). Chen, Y. N., Xie, B., Mao, E. R. Electric Tractor Motor Drive Control Based on FPGA. Proc. 5th IFAC Conference on Sensing, Control and Automation Technologies for Agriculture (AGRICONTROL), 271-276 (2016). Zhang, J., Zhou, Y. J., Zhao, J. Study on Four-quadrant Operation of Brushless DC Motor Control Method. Proc. International Conference on Mechatronics, Robotics and Automation. (ICMRA 2013). 1363-1368 (2013). Joice, C. S., Paranjothi, S. R., Kumar, V. J. S. Digital Control Strategy for Four Quadrant Operation of Three Phase BLDC Motor With Load Variations. Ieee T Ind Inform. 9, (2), 974-982 (2013). Drumheller, Z., et al. Optimal Decision Making Algorithm for Managed Aquifer Recharge and Recovery Operation Using Near Real-Time Data: Benchtop Scale Laboratory Demonstration. Ground Water Monit R. 37, (1), 27-41 (2017). Wang, X. S., GAO, Y., Cheng, Y. H., Ma, X. P. Knowledge-guided genetic algorithm for path planning of robot. Control Decis. 24, (7), 1043-1049 (2009).